Asiana Airlines has long operated in the shadow of Korean Air, which itself is a quiet achiever despite its status as the largest Asian carrier across the Pacific. Asiana is now seeking to narrow the gap by using A380s to grow long-haul services, commencing to Los Angeles in Jul-2014, increasing the proportion of long-haul flights as the carrier becomes concerned about mounting short-haul competition. Despite being two-thirds the size of Korean Air, Asiana’s short-haul North Asian network is four-fifths the size, suggesting over-exposure. 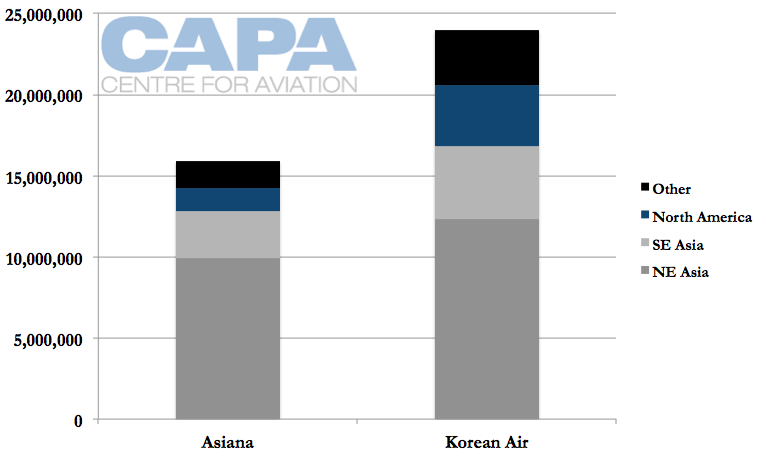 Asiana’s North America market is meanwhile one-third the size of Korean Air’s, suggesting under-exposure. 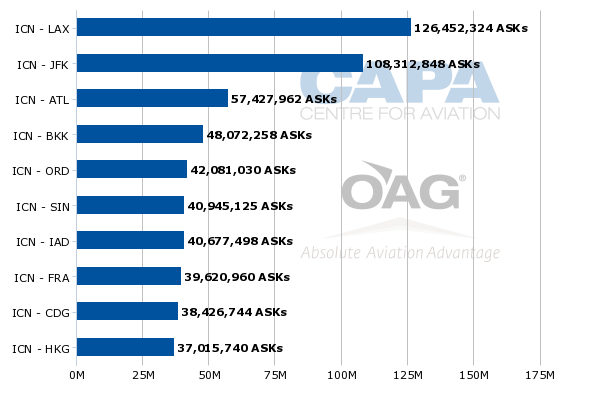 The catch-up game is however not just with Korean Air but a number of other carriers – like Air China, EVA Air and Hainan Airlines – that are rapidly growing their North American networks. For Asiana time is pressing to make its move, as the environment becomes more challenging – and will continue to be, as carriers cash in on the economic recovery in North America. Asiana’s six A380s are due to be delivered by 2017, with two aircraft in 2014 (May and June), two in 2015 and the final two in 2017. Asiana intends to use the A380s mostly for capacity up-gauging on existing routes, allowing widebody aircraft to be re-deployed. Asiana also has 30 A350s on order. Korean Air’s passenger fleet is some 68% bigger, ending 2013 with 121 passenger aircraft to Asiana’s 72. 51% of Asiana’s fleet is widebody aircraft whereas at Korean Air this figure is 65%. This metric is not necessarily straightforward as some widebody aircraft are used on short-haul regional (China, Japan) and long-haul regional (Indonesia) routes, but the approximate gap is indicative. The metric is also one Asiana is monitoring, with CEO Kim Soo-cheon telling Joongang that widebody aircraft will account for 60% of Asiana’s fleet at an unspecified point in the future. In 2014 Asiana plans a net withdrawal of two narrowbody aircraft and net gain of three widebody aircraft, boosting the widebody share of Asiana’s passenger fleet to 54%. Korean Air in 2014 plans to take delivery of five widebody aircraft (two A380s and three A330s). Two unspecified passenger aircraft will be retired. Korean Air’s widebody share will slightly increase to around 67%. Korean Air is more exposed to long-haul traffic, with 16% of its international seats ex-Korea going to North America (Asiana: 9%) and 7% to Europe (Asiana: 4%). There is point-to-point long-haul traffic of course, but Asiana and Korean Air have carved niches bringing passengers from North America to Asian countries besides Korea, and particularly China. A connecting itinerary requires a long-haul seat to be paired with a short-haul seat. 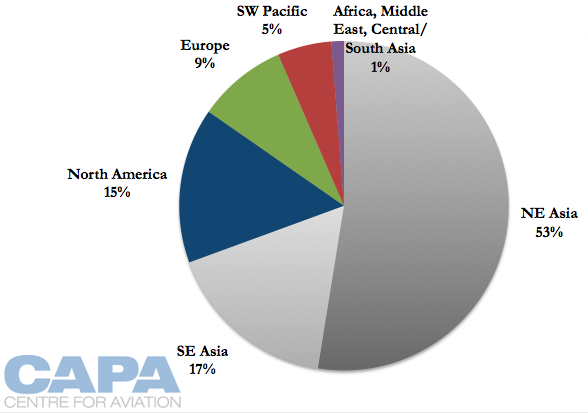 Since Asiana has a lower percentage of long-haul seats, Asiana is carrying more regional traffic and is less exposed to the competitive but rewarding trans-Pacific market. Looking at how this balance has shifted in recent years, Korean Air in 2008 had no proportional change in its Northeast and Southeast Asian markets, which account for 70% of international seats from Korea, as they do in 2014. This suggests Korean Air has been satisfied with the balance between long-haul and short-haul. 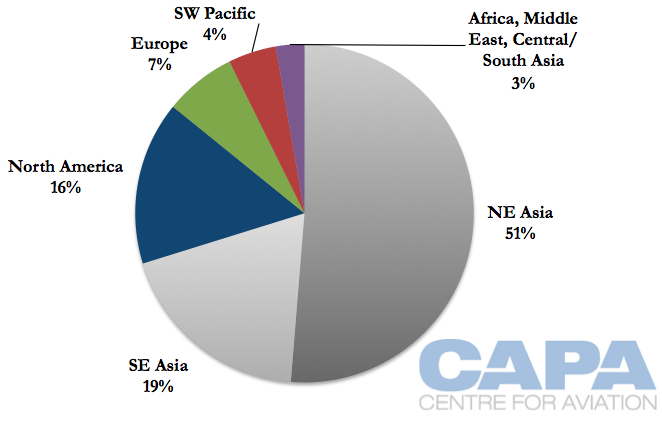 North America has increased by 1ppt while Europe and the Southwest Pacific have lost some ground picked up by Korean Air’s diverse Africa/Middle East/Central Asia/South Asia market. 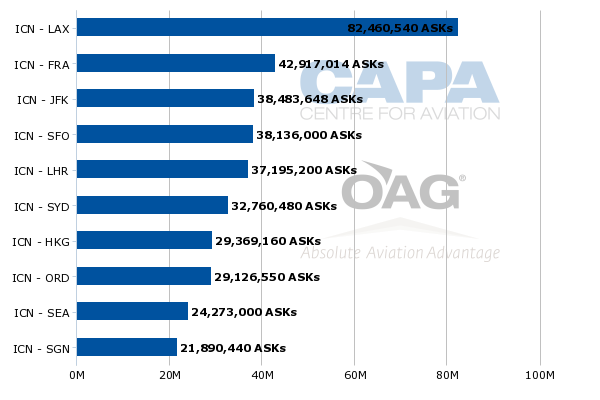 Many of these markets are far from the maturity of Korean Air’s North American market, suggesting Korean Air is having difficulty expanding beyond its Asia-North America corridor. Asiana’s network was approximately the same in 2008 as 2014, with 2008 seeing 81% of international seats ex-Korea bound for North and Southeast Asia, although more recently there has been a slight shift with Southeast Asia seeing more capacity share. Asiana’s long-haul markets have barely changed, indicating the forthcoming change it will implement is structural. 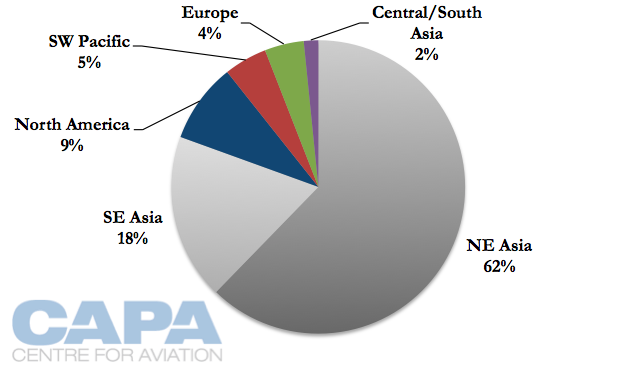 The share of seats operated by LCCs in North Asia is a fraction of that in Southeast Asia, but momentum abounds. Korea was arguably the home of the LCC boom when a flurry of carriers was established around 2008. The effort was never fully consummated and Korea’s LCCs (including Asiana’s at-times aloof LCC subsidiary Air Busan) have not practiced strict cost control. While this token measure sufficed for a few years, incoming LCCs from Japan – and soon Taiwan – reminded Korea’s LCCs of the need to shape up. Full-service Chinese carriers will increasingly challenge Asiana on intra-Asia routes, and in the long-term should achieve a cost advantage. The imbalance Asiana sees in its short-haul and long-haul markets is most apparent when looking at the actual capacity figures and not just proportions. Asiana’s international network from Korea is about two-thirds the size of Korean Air’s, but Asiana has four-fifths the size of Korean Air’s North Asian network, suggesting over-exposure. 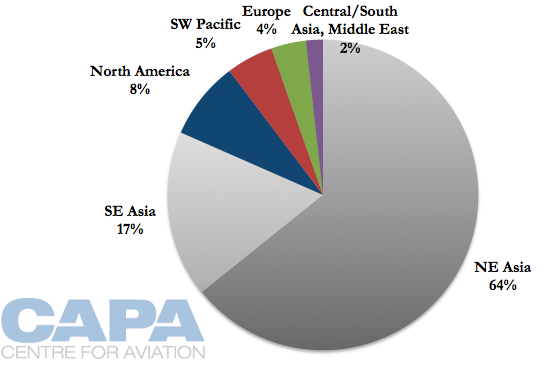 Meanwhile Asiana’s North American network is about one-third the size of Korean Air’s, suggesting under-exposure. However, proportionally matching Korean Air on long-haul could be difficult given Korean Air’s status as the largest North Asian carrier across the Pacific. But inroads from Asiana add another competitive layer to the trans-Pacific market, with all North Asian carriers planning to add significant capacity. Asiana is largely in control of its destiny; the US-Korea open skies arrangement (one of the oldest) does not inhibit growth. Star Alliance member Asiana has not made significant inroads with North American partners. Neither has Korean Air, but this could change as Delta Air Lines aggressively comes into the frame. Neither Korean airline has yet been invited by its North American alliance partner to establish the highly valuable trans-Pacific JVs that United-ANA and American-JAL enjoy. Although it inherited Northwest's extensive intra-Asian network, Delta does not have a Japanese airline counterpart, so is theoretically more amenable to going ahead with Korean. Asiana plans long-haul deployment of its A380s in Jul-2014 on the Seoul Incheon-Los Angeles route. The A380s will also be used on regional flights to Japan. Korean Air meanwhile is starting to go on the offensive, loudly promoting the fact that it will be the only carrier to offer double daily A380 flights from both the US east and west coasts to Asia. 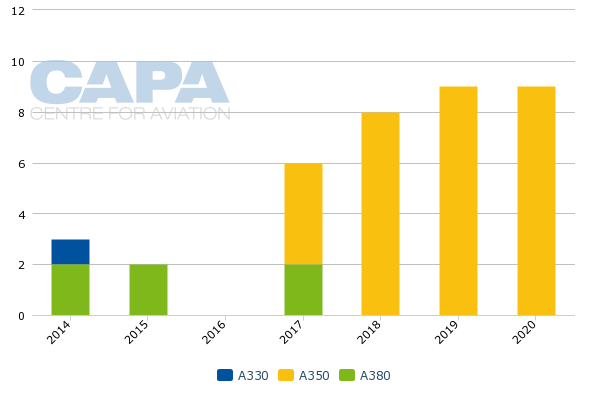 Asiana’s capacity increase by up-gauging to A380s will grow its position in North America, but the exact growth depends on its unspecified configuration and where additional capacity will be deployed with aircraft being replaced by A380s. And the wider market environment depends on moves from competitors, which are occurring more rapidly, making for a dynamic market. Asiana is at last seeking a rightfully more substantial position for itself. The assertion of its role however comes as other North Asian carriers have made that decision as well. Seoul Incheon provides advantages in the form of geography (largely on the flight path between North America and other parts of Asia) and is an attractive hub, in terms of efficiency and other quiet but traveller-attractive factors like duty free selection. Yet the North American market is also quickly becoming intensely competitive, making capacity additions more fragile than in past years. 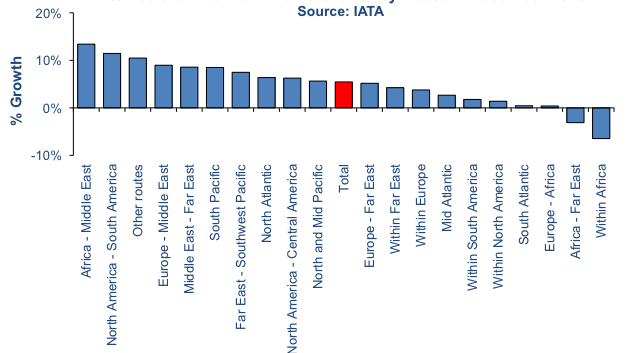 There are encouraging factors: the US is processing far more visas from China, and North American corporate travel is recovering, with IATA’s Dec-2013 premium traffic monitor finding North and Mid Pacific premium traffic grew at 5.7%, above the global average of 5.5%. The biggest implication is that Asiana is changing its focus. That is a vote of confidence in the trans-Pacific market, which many would agree with. But there are also warning bells sounding about the potential for intra-North Asian travel to suffer depressed and, in many instances, ultimately unprofitable yields, as has occurred in the highly competitive Southeast Asian market. A remaining question, which will take some time to resolve, is if Asiana, and to a degree other North Asian carriers, embarks on establishment of a more globally recognisable brand. Cathay Pacific and Singapore Airlines have done this exceptionally well (although they may wish they received higher rewards for it). The alternative is to generate inbound traffic mostly on the basis of lower prices; a higher quality inflight product is also an attraction that many Asian airlines have over US carriers, Here the A380 has been a significant differentiator too; Korean's version for example contained only 402 seats, with the entire upper deck in 2-2-2 lie flat business configuration. Asiana's fitout is more conventional, with its 494 seats, but still offers a substantial improvement over its US counterparts. But so long as Asiana's brand remains relatively insular and a bit quirky, it will fall short of achieving its full potential.